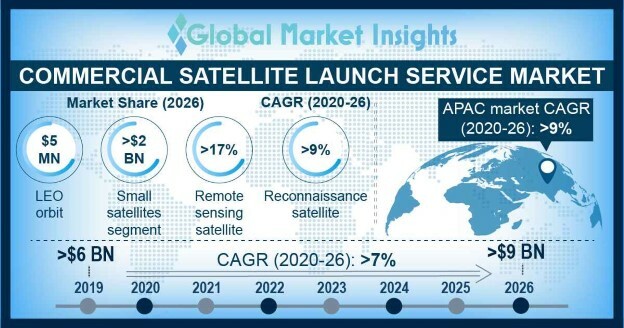 Commercial Satellite Launch Service Market size is estimated to surpass USD 7 billion by 2024; according to a new research report by Global Market Insights, Inc.
Increasing usage of communication data-based services and GPS systems is driving the commercial satellite launch service market size over the forecast period. These services are adopted by various sectors such as Automotive, Electronics, Military, IT, among others. Increasing number of vehicles integrated with built-in navigation units will contribute majorly for launching additional satellites. Additionally, Oil & Gas companies across the globe uses vehicle tracking systems for their official vehicles and tankers to locate their vehicles and maintain transparency. Usage of smart devices and services for personal use such as Smart TVs, online streaming services, etc. accelerates the financial investments. High demand for weather forecasting software is witnessed such as AccuWeather, The Weather Channel, Yahoo Weather, Google Weather, etc. Schools and colleges across the globe are introducing new smart classes initiatives. Rising penetration of mobile phones internet usage across the globe owing to next generation 4G/LTE networks with attractive data plans is driving the wireless technology. Due to proliferating usage of these applications across the globe additional number of satellites will be required. This in turn will escalate the revenue generation of the commercial satellite launch service market. Technological advancements will result in decline of the launching service cost. For instance, in 2017, ISRO announced the launch of 3000 satellites in the next 10 years for navigation-based applications. In 2017, Airbus commissioned a high-volume satellite factory in the U.S. to build OneWeb satellites with an annual investment amounting to USD 17 billion. The focus is to reduce weight and enhance performance. The modular satellites are easily customizable with various configurations according to the user requirements. Increasing manufacturing of satellites will positively impact the commercial satellite launch service market size. The European Space Agency (ESA) is exploring alternatives to introduce micro launchers for various applications such as education, technology demonstration, telecoms, and earth observation. With this ESA aims to target companies with small satellites focusing on various mobile applications. However, the prohibitive cost of commercial satellite launch services is hindering the industry growth. Moreover, the lack of proper commercial satellite launch facilities, quality control, launch problems, supply chain issues may negatively impact the industry size. However, with the growing demand for satellites, prices are expected to decline, resulting in strengthening of the commercial satellite launch service market size. LEO is likely to exhibit over 3% CAGR in the commercial satellite launch service market from 2018 to 2024. This growth can be credited to low initial launch cost as compared to other orbits, less time to deploy and compact size commercial satellite. LEOs are a positive step towards providing connectivity to remote areas. The micro segment of the commercial satellite launch service market share is expected to pose a CAGR of more than 6% over the forecast period. This growth can be attributed to the continuous developments improving reliability and affordability of the launch vehicles. Reconnaissance commercial satellite launch service market size is expected to hold around 36% of the revenue share by 2024. Introduction of new farming techniques such as precision farming, utilizing the satellite imagery for improving farming will play a key role for the industry growth. Geographical Information System (GIS) tools and online web resources with the help of UAVs for farmers are spurring the segment growth. North America was worth more than USD 2 billion in 2017 and is anticipated to dominate the commercial satellite launch service market share. This can be credited to robust infrastructure available in the region for developing new space programs by organizations such as NASA and SpaceX. Increasing number of navigation and communication satellites for locating destinations and data usage is significantly contributing towards regional growth of the commercial satellite launch service market. Airbus S.A.S., Arianespace S.A., Axelspace Corporation, Boeing, Lockheed Martin Corporation, Orbital ATK, Space Exploration Technologies are few industry participants in commercial satellite launch service market. Joint ventures and partnerships are among the prominent strategies implemented by the competitors to enhance their industry share. For instance, in 2018, United Launch Alliance acquired Atlas 5 division of Lockheed Martin for reducing launch prices and improving business efficiencies. Several industry players are focusing on innovations and next generation technologies to reduce satellite weight, introduce flexible modularity options, and low-cost models to enhance the commercial satellite launch service market share. Generally, the launch services are designed for a single time use. However, with the latest developments for vehicle reusability will further widen the industry scope over the forecast period.